Cobwebs sees Peter Davison, Janet Fielding, Sarah Sutton and Mark Strickson reunite for the first time since 1983 in a trilogy of adventures. 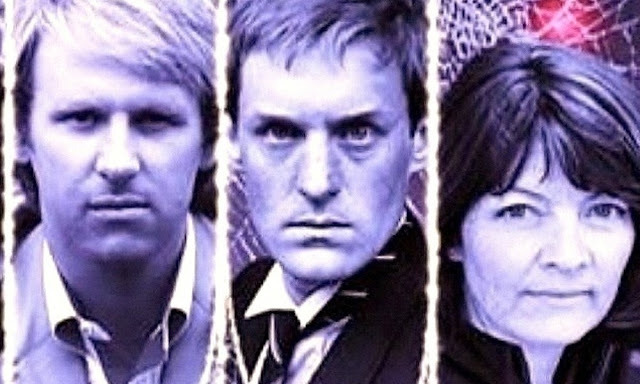 Set immediately after the television story Enlightenment which saw Turlough redeem himself, the first hurdle Cobwebs has to jump over is how to reunite Sarah Sutton with the others after she left at the end of Terminus. Author Jonathan Morris manages to accomplish this is a satisfying enough manner combining time travel and the old team are back together investigating an abandoned facility on the planet Hellheim which is inhabited by EDGAR, the deranged station's computer. Overall, as a story, Cobwebs hinges on a predestination paradox which is revealed at the end of part one and it is surprising that other Doctor Who stories didn't utilise this paradox. However, the problem with this paradox is how to resolve them without making the audience roll their eyes in disgust. I think the end of Cobwebs just about holds up because it is just about plausible. It strongly ties up the loose ends from the beginning of the story and it makes logical sense. But it isn't as clever at you want it to be after listening to the rest of the story and it does feel like a bit of a let down. Alright it is a let down that you can live with though because you finally get to hear the Fifth Doctor's team together again. It is no secret that actress Janet Fielding didn't want to do any of these but she agreed to one story, The Gathering, as a favour to her friend Gary Russell. But Fielding then had a change of heart and agreed to do more stories and she throws herself into the role headfirst. For those of you hoping to hear a gentler, lighter hearted Tegan then I'm sorry but you'll be disappointed but we do get is a faithful reprise of Tegan from the 1980s. She is still sharp, loud and can complain but I don't care since she is my favourite companion from the history of the show. She still hates Turlough's guts and she still clicks with Nyssa. Mark Strickson has also stepped back in time well creating a faithful performance as Turlough and is a great combination of sarcasm and guilt. Sarah Sutton is still great as Nyssa and while we can clearly see from her performance that this is an older Nyssa, her performance is a little unsure and we sometimes hear the younger Nyssa rather than her older version. Cobwebs is a great story for any fan of the 1980s era and of the show in general and the audio format allows the three companions to have more to do. All throughout the story, the characters we love are at the forefront. Which is exactly where they should be. COBWEBS, WRITTEN BY JONATHAN MORRIS AND STARRING PETER DAVISON, JANET FIELDING, MARK STRICKSON AND SARAH SUTTON AS NYSSA WAS RELEASED BY BIG FINISH PRODUCTIONS IN JULY 2010.